Friday November 1st, grade 8 had the great opportunity to head to the Rogers Center in Toronto for an amazing day! We met with over 700 people from 30 different Christian and Catholic Schools in the GTA, at an event put on by the Toronto Argonouts and Athletes in Action. We began our day by participating in a flag football tournament, where each student showed great sportsmanship and teamwork during each one of our games. For the afternoon, we all headed up to the 500-level where we participated in various activities that were designed to get students from the different schools to interact with, and get to know one another. The grade 8s all set a great example as they listened and took on some leadership roles throughout the afternoon. Elodie Li Yuk Lo, an Olympic athlete, talked to us about how her life was changed as she began to define herself as a Christian athlete, and began to develop the whole person � physically, mentally, and spiritually. We were all challenged to ask ourselves "Who am I?� The Huddle-up talk was a powerful reminder on what bullying looks like. We were challenged to stop the bullying that we see happening around us, "even a smile can make a difference�. The room was so quiet as we listened to his story and his challenge to stop the bullying that we see happening around us. By 5:00pm we were all hungry, so we headed outside for a tailgate BBQ, and took a walk around the Rogers Center, looking at the nearby sights that Toronto has to offer. 7:00pm was kick-off for the Argos vs. Alouettes game. We all enjoyed watching the two teams compete on the field that we were just on earlier that day. 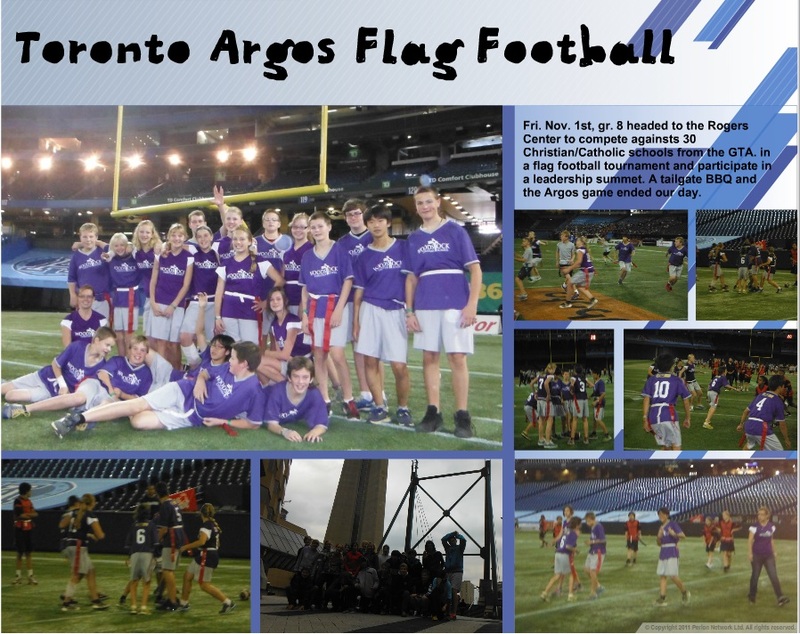 While the Argos didn�t win, they put up a great fight. Friday was a day that we will never forget! A huge THANK YOU goes to Mr. Branderhorst, and Mr. Lendvay who came with us. Without the both of you, this day would never have been possible. A thank you also goes out to those who came and met us for the game later in the evening. We really appreciated you coming and helping to support our school.